Oasis Dunas Aparthotel is perfect for all the family with fantastic facilities on and off site, set in a great location. You will find the Baku Waterpark approx 200 metres from the complex and the resort centre approx 400 metres away. We stayed at the Oasis Dunas in a private apartment so I will review the complex itself. 3 good sized pools one of which is heated in the cooler months. Plenty of sunbeds. There's a baby pool also & we saw lots of little ones enjoying themselves in there. There's also a pool with slides for the older ones. Next to the pools is a snack bar, where, apart from snacks you can have cooked breakfast from 9am & there's lunchtime specials on every day. There's also a Happy Hour here from late afternoon. At the entrance to the complex there's a large bar with indoor & outdoor seating & across from the bar is the Pizza restaurant which does a variety of meals to either eat at the outdoor tables or you can take away. The complex is fairly large with plenty of families holidaying here, so ample chance of your children making friends. It is however quiet of an evening as no loud entertainment going on. 5 mins walk away is the Campanario Centre where there's a large supermarket, the Dunas does have a small supermarket on-site for any essentials ie large bottles of water so saves you having to carry them far. You are also only 5 mins walk from the top of the main street where there are plenty of bars, shops & restaurants. Hotel tip: Try for pool view room. Some of the ground floor apartments at the rear of the complex didn't get any sun. Went to breakfast every morning and I couldn't fault it but evening meals was a bit bland for me so we went out a few nights for food but what I did eat was good food to be fair. We went to the Oasis Dunas on 29th July for a week half board with my wife and 2 lads (15 & 14) and had a great time there, we wished we had booked a few more days. Went to breakfast every morning and I couldn't fault it but evening meals were a bit bland for me so we went out a few nights for food but what I did eat was good food. We also ate at the pool bar on a afternoon and the food was bang on. We had food from the pizzeria and couldn't fault that and my 2 lads had loads from there. Rooms were sound (room number B304)and just the right size. We were room only as we don't go on holiday to spend our time in our room and just wanted what we paid for. The shower worked, the beds were adequate for sleeping in, the fridge worked and the balcony was a good size for 4 people. The cleaners did a really good job and you can't knock them. The swimming pools are a good size and look good but it's a salt water pool and it kills your eyes and lets these apartments down. Getting a sun bed is a right nightmare, you have to be up and out your room at 6am to even stand a chance of a bed around the pool but what I will say is the pool areas are very clean and tidy. We didn't see that much of the entertainment as we went out most evenings and just caught the end of the shows but it was just your typical hotel stuff the reps put on. The Goose Bar was sound on a night and open till just after 1pm and had a happy hour 10:30pm to 11:30pm. The location was good and right by an Aqua Park and 3 mins walk to the start of the strip where all the bars/shops/restaurants are. Make sure you come off the main strip as there some good restaurants knocking around and a lot cheaper in price. If you walk out the front of hotel and turn left and walk 5 mins there is a great supermarket, a good few shops and really cheap bars down there. Overall we had a brilliant holiday and would definitely go back. Hotel tip: Free Wi-Fi outside The Goose Bar between 8am to 12pm. Booked this for a Christmas treat what a mistake kitchen looked like it was constructed by a two year old. Wi-Fi had to be paid for but could only be used in reception area. T v was paid to view with only a couple of English channels. Went half board, food was the same things for two weeks. Furniture was tired and dated. The only good things were swimming pools and weather. Will not be booking with Thomas cook again dreadful. We stayed in 2 bed Apartments which was very clean but could do with curtains and couch upgraded they looked quiet old. Pools were kept well. Food and drinks from the pool restaurant and pizzeria was nice. The staff throughout the hotel were excellent Veronice cleaned our room, Trevor from the bar and Emma for the restaurant were lovely. 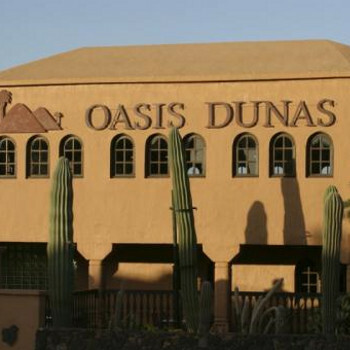 Oasis Dunas is central to everything and only a few minutes’ walk to shops, restaurants and beach. Waterpark and market 3 minutes’ walk. We stayed 1 week self catering in a one bedroom apartment. The check in was smooth and was no problems. Initial reactions walking into the apartment were good. Its small, plain and simple but that's all you need. It was very clean and had maid service twice during the week. I thought the towels weren't big enough and the bath plug leaked BUT they didn't bother me. The pool bar offered burgers, hot-dogs, sandwiches, beer, cocktails etc just the usual and friendly staff behind the bar. There is a lifeguard who walks around, sorts out sunbeds and cleans up. The maintenance man is quick to fix things, we had a broken light and also our door handle came off and he sorted both within 10 mins which I thought was very good. The Thomas Cook entertainers kept us amused during the day with quizzes and a range of various games on offer if you choose. They also run a night time entertainment programme, which includes bingo, quizzes and music performances. The hotel is situated a 5-10 min walk into the town, which suited us as was fine and quiet. We were there for one week and after two days we would have gone home if possible. The apartment was outdated and very basic, very uncomfortable. A light hanging from the ceiling and the front door only opened half way and did not lock from the inside. The TV was old about 12in screen which you had to pay for if you wanted to use it. Staff unhelpful and the attitude was take it or leave it. If they took as much care of the apartments as they do of the grounds it would serve them better. A very mixed holiday at the Oasis Dunas. The hotel is very basic with no air conditioning in the rooms. Twice I complained about the windows in the main lounge area not opening. As one of the beds was in this room where my son was sleeping and the fan provided totally inadequate the response was poor. The food was definitely the worst I have ever encountered for half board. The choices were very poor and especially on the childrens section. The breakfast cereals and meats at meal times were of poor quality and this prompted us to eat out more than eat in the hotel even though we were half board. The hotel location was good opposite the water park and free access was part of the package. The Thomas Cook entertainment and kids club staff were excellent and my son enjoyed these. However, on the last day we checked out we realised we had left the camera in the apartment. However, when we returned later we found the apartment had been cleaned and the camera had been taken. Reception explained they would get in touch with the maids but we did not get an answer by the time the coach arrived to take us to the airport. Since this time reception said there is no sign of the camera. It was only a cheap old camera but held all our memories. I find this appalling that such low value items could be stolen like this by trusted staff. I will not recommend this hotel to anyone and never stay here again. We have just returned from this holiday and we are certainly planning to go again next year. All the staff from reception to entertainment to cleaners were all very pleasant and worked hard to please everyone. We went half board and before we travelled we said we would probably go out for one or two meals out in the evening - but we changed our minds after experiencing the evening buffet. A big variety of hot and cold foods and there was plenty for all - we never had a poor meal in fact It was all excellent. Breakfast was just as good. Truthfully the hotel could do with a bit of paint and room furniture could do with replacing but it was a minor detail. The vast swimming pools were all clean but it was sea water and quite cold. Plenty of beds but same as always you have to be up early to put your towel on a bed or no bed. But the staff did remove towels around midday. The entertainment staff worked really hard and I don’t know how they stayed so cheerful after such long hours - Thomas Cook really could do with providing them with some better equipment though - it was great if you had kids. They provided activities throughout the day. Rooms were basic - beds comfy. Clean and adequate. Just needs a bit of a face lift and new furniture. Cleaners come in most days. Safety locks are provided at a cost & deposit. Fans are needed and can be hired. TV also has to be paid for - but who needs TV when on holiday? We enjoyed this holiday very much.